Once per turn, during your opponent’s Standby Phase: You can inflict 300 damage to your opponent for each card your opponent controls. Each time your opponent Sets a Spell or Trap Card(s): Inflict 300 damage to your opponent. Blood Mefist had some serious hype when it was a prize card back in 2011. Generic Level 8 Synchro, good stats and support. Burn damage dependable on cards your opponent controls is always a double-edged sword. On one hand, the more cards the more damage, but the more cards they have, the better chance they usually have to counter your plays. The second burn effect is a great effect if you have control of the game, and you can punish your opponent for setting cards. The damage with Blood Mefist can add up with even only one turn on the board. This cards playability isn’t entirely dead now with the new overtime rule. While it is easier to go into Cowboy and game your opponent, that is only if you can get the lead with the 800 damage Cowboy can do. If it is your Main Phase and your opponent has more than that on you, Blood Mefist is now an option if you are able to make him. Yes, he’s a Level 8 Synchro, yes Synchros are a bit outdated to many players and the meta with Link and Xyz Summoning, but it is still an option and still a good card. First turn Mefist is still 1500 damage, that’s nothing to scoff at. Blood Mefist is a Level 8 DARK Fiend Synchro with 2800 ATK and 1300 DEF and requires 1 Tuner and 1+ non-Tuners. ATK is great and DEF is bleh, DARK and Fiend are great, and the summoning requirements are perfect as they are generic. Once per turn, during your opponent’s Standby Phase, you can inflict 300 damage to them for each card they control. Well, simple burn is simple, and it is nice to have access to. Can’t complain about some burn sometimes. Each time they set a Spell or Trap card, they are inflicted another 300 damage. Not every deck has backrow to set, but many decks rely on their backrow, so this can punish them with some decent damage. Blood Mefist is a simple burn card that is good in some match-ups and would be worth having on hand if it wasn’t for the fact that it was a Prize Card with limited printing. Still an ok Synchro that is good in some match-ups, but there are better Level 8 Synchros out there. Art: 4.5/5 Very creepy, I like it. Throwback Thursday brings us to Blood Mefist (an English card with the word Blood in the title!) and as we creep closer to Halloween, this seems to fit the theme of that, at least in artwork. 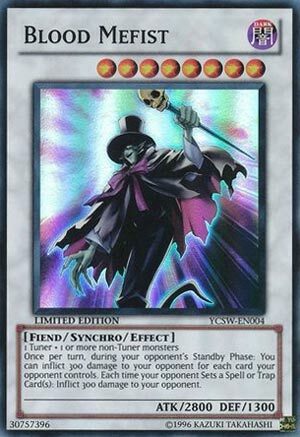 This, being a card from the Yugioh Championship series of 2011, is a Level 8, Fiend, Synchro, generic requirement of one Tuner and one or more non-Tuner Monsters, with a lovely 2800 attack (blah 1300 defense). This guy can lead or be a focal point of some very, albeit likely, unconventional Burn Decks. Once per turn, during your opponent’s Standby Phase, you can deal 300x Damage for each card they currently control. Also, your opponent gets hit for 300x Damage each time they set a Magic or Trap card. This card might be a little TOO good if it were simply, each time they played a Magic or Trap, but this guy can add up to lots of Damage, really fast. Like most integral pieces of a Burn Deck, how well you protect this, and to the point, keep Mefist on the Field, is going to determine how effective he is. But he’s a powerful card in his own with the 2800 attack, and a double constant, yet separate Burn effects make me really like this card. If you have one, can find/have found one, build a Deck and see what happens. Blood Mefist has nothing to do with my fists and burns the opponent and a good stat easy summon body. Blood Mefist is a Level 8 Dark Fiend-type Synchro Monster with 2800 Atk and 1300 Def. It’s generic and does not need to be properly Synchro Summoned to gain the effects. Let’s face it, the stats are better than Stardust Dragons and the effects are certainly more offensive. You can burn your opponent for each card they control multiplied by 300 once per turn during their standby phase. 3900 Damage at maximum if they control every zone, but that means you’re probably not going to win anyway. Then, every time they set new Spell or Trap cards, you can burn them for another 300 per card. Excellent. It’s too bad Blood Mefist is a prize card, but it is certainly worthy of being won.